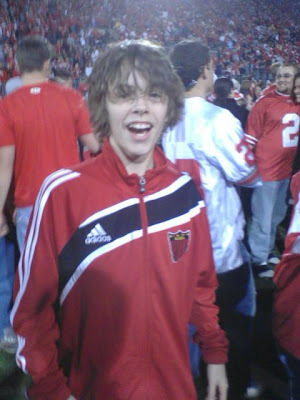 A message from Joyce: I just received an email from TJ asking me if I heard about the accident in Columbus this weekend that killed two high school students. The media is reporting that had they been wearing their seat belts they would likely still be alive. When I hear these stories my heart just breaks for the families. It also reminds me of the message that TJ has lived to tell. With winter weather and holiday parties upon us, I thought it would be a good time for a reminder. I was so happy to see Ridge today. "Did you eat too much turkey, Ridge? I did too. I think we better go for a walk"
A message from Joyce: We hope everyone had a wonderful Thanksgiving. We actually celebrated today and both Sarah and I ate way too much. Over the past few years different families have referred to a handout they have been given by a social worker at the hospital which describes potential reactions of friends and family members when a child is born with a disability. It talks about different categories like the rocks, the wanna-be-theres, and the gingerbread men who run and run as fast as they can from you when they hear of your baby's birth. Does anyone have this handout? I would love a copy for my files. 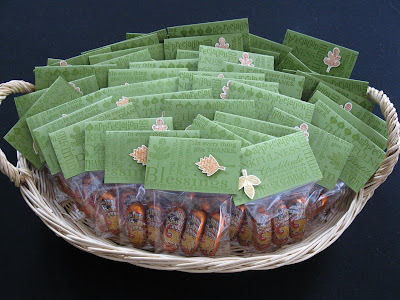 My mom and I made some more treat bags. 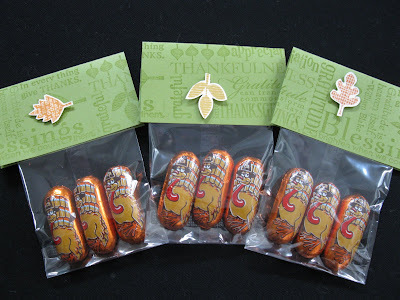 This time for Thanksgiving. I rolled and stuffed and she cut and stapled. We decided to make enough for all of the families that work for my Dad. It is such a wonderful feeling to do things for other people. I am thankful that we can help others. And speaking of helping others. Did you read about Lydia yet? SHE DID IT. She raised over $26,500 from just 300 donors and she was on TV this morning talking about it. Darya will soon have a forever family. That makes me so happy. Congratulations to Lydia. She is only eleven but what a difference she has made. This story is so amazing. 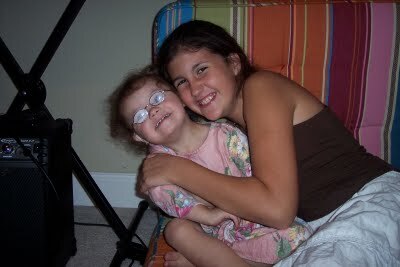 This is Lydia with one of her sisters. Lydia decided that her family truly needs to adopt a little girl named Darya who lives in another country and has Down syndrome. It must happen quickly because Darya is close to being sent to a permanent orphanage. Please click HERE to read the story. They need our help NOW. 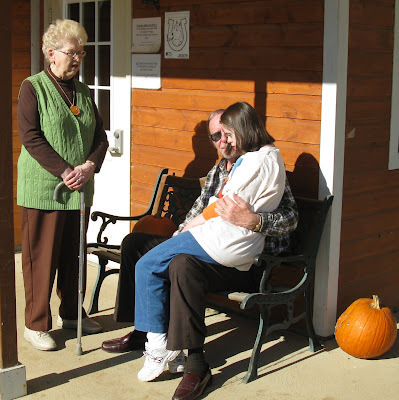 What a great way to show how thankful we are this Thanksgiving by making a donation to the fund to bring her home. They need $20,000. That is a lot of money, but every little bit helps. Wow!! Did you catch Oprah today? 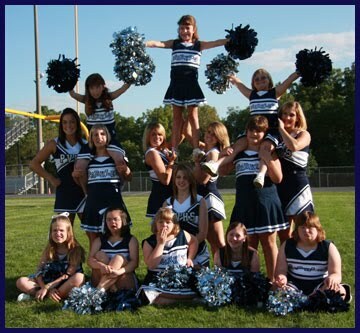 She had this group of cheerleaders on and they got to meet and sing with Miley Cyrus. I am so jealous. Check out their website HERE. Does anyone know a Sparkler? They are from Iowa. A message from mom: Last Wednesday evening I tried to convince Sarah to go with me to Columbus. 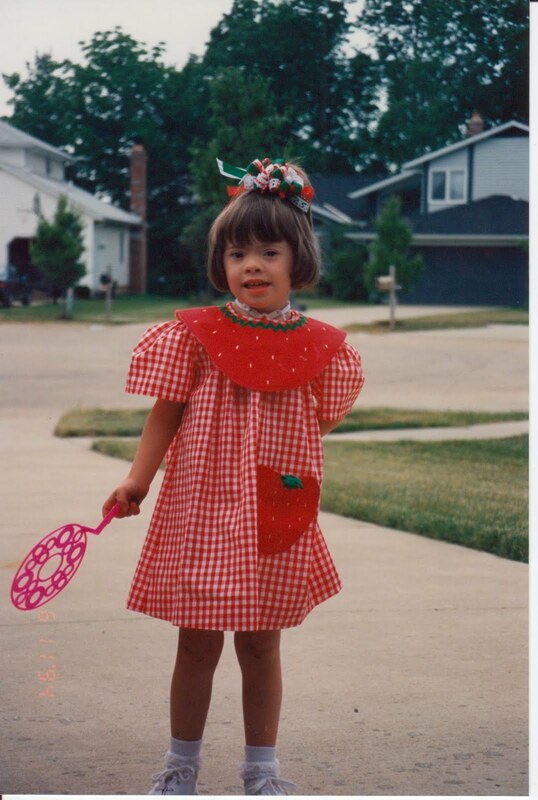 I had a meeting at the College of Social Work at The Ohio State University the next day where we were likely to discuss Sarah’s scholarship and the new Adult Down Syndrome Clinic just established at the OSU Medical Center. But that’s not why I wanted Sarah to go with me. I wanted to take her to Borders Books and Music on Friday. To meet Sarah Palin. I wanted Sarah to meet Sarah. Now for those who know me, really know me, I can hear what you're saying, “Joyce, I thought you were a die hard equal rights, burn your bra, women deserve a choice, liberal kind of gal. Why would you want to meet Sarah Palin?” This wasn’t about politics. It was about meeting another mom. One who belongs to the same T21 club as me. A working mom. Trying to balance many hats, hers much more public and probably more important than mine. Yet at the end of the day, we both kiss a sweet little pug nose positioned between two adorable almond shaped eyes. We snuggle that thick soft neck while holding the short little fingers and we wonder what the future holds. For several months now, our blog has been getting frequent hits from Wasilla, Alaska. If you’re like me, until the Palin’s arrived on the national scene you never heard of Wasilla. We know from the media, it is not very big. Quite small in fact. So I have been wondering if someone from the Palin family has been reading our blog. Specifically, has Sarah Palin been glimpsing at the real life of our high school graduate? 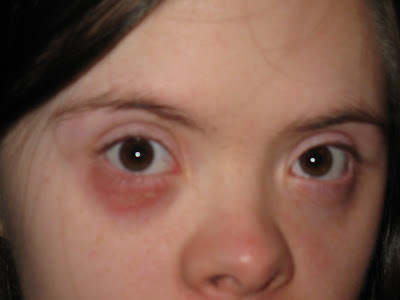 A twenty something with Down syndrome. I was curious to see if she recognized Sarah when we walked up to the table. I will never know the answer to that question. Why? Because Sarah refused to go with me to Columbus. 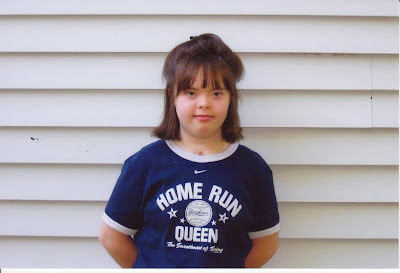 My Sarah, the one sporting the extra chromosome, the one that many believe is not worth living, told me she could not miss work. I was trying desperately to convince her to just skip it. But she was telling me, with greater conviction, that she must report to her job. I thought a lot about that exchange as I drove to Columbus. Alone. Most folks I know would jump at the chance to skip work for two days. Many would camp out in the store parking lot the night before just to be the first in line to see a celebrity. They’d wave their autographed book in the air when they returned on Monday to show others they had rubbed elbows with the famous woman. They wouldn’t think twice about missing their job responsibilities. Not my Sarah. She takes her job very seriously. For the past month or so she has been working in the dining room of a nursing home. Her task is to wash all the plastic menu covers after they have been used that day. Nothing glamorous. In the grand scheme of life, not very important. Yet to those hundred or so residents who will look at those menus tomorrow, it is a very important job. 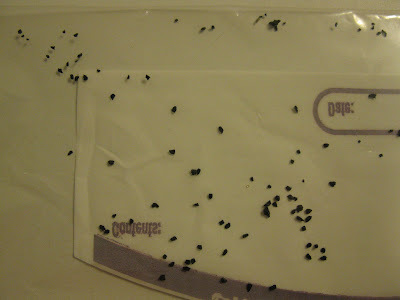 They want their plastic covers to be free of sticky finger prints and germs. They count on Sarah to make that happen. And for that, I am so proud. Afterall, isn’t that what all parents want? For their adult children to be responsible, hard working and happy. Maybe one day we will meet Sarah Palin. And if I do, what would I tell her? Slow down. Enjoy Trig. Savor every moment. Don’t worry so about the future. Just be. The rest will follow. We have been very busy this weekend in the Stampin' room. Thank you cards. My mom is working on a video to show how I have been helping. Flashback Friday ~ What is a Jely Splat? 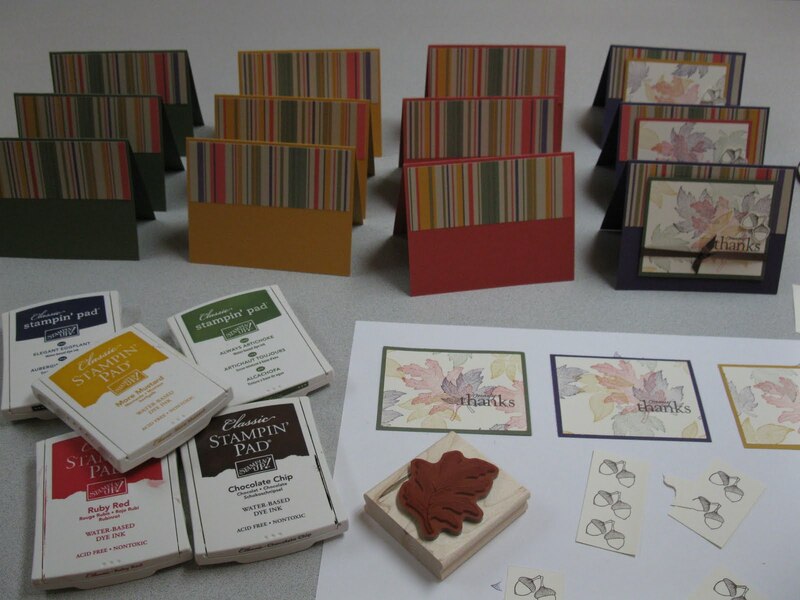 A short while ago we talked about creating new designs for Jely Splats. You may be wondering what a Jely Splat is. This dress I am wearing is an example. It was one of my favorites because I loved the big strawberries. Here is what makes it special. The top strawberry looks like it is a part of the dress. But really it is detachable and functions like a bib. We call it a "Splat Mat." Underneath is a waterproof flannel backing so the dress does not get wet from my trach secretions. When the collar part is soiled it is removed and replaced with a second Splat Mat. Each outfit comes with two or three Splat Mats depending on the child's needs. Each dress or shirt is designed in such a way that the Splat Mat looks like it just belongs. We are working on some new designs. My mom just got a call today that some fabric we have been waiting for has come in, so stay tuned. My Dad works very hard. He usually works about 60 hours a week. He and my mom own their own business and they want to be sure to keep all thirteen employees paid. He is very proud that in the nineteen years they have had this business they have never missed payroll once. If Matt doesn't have a soccer or basketball game, after he eats dinner he goes up and lays in his bed. Sometimes I join him. I like that. Sometimes he is by himself. 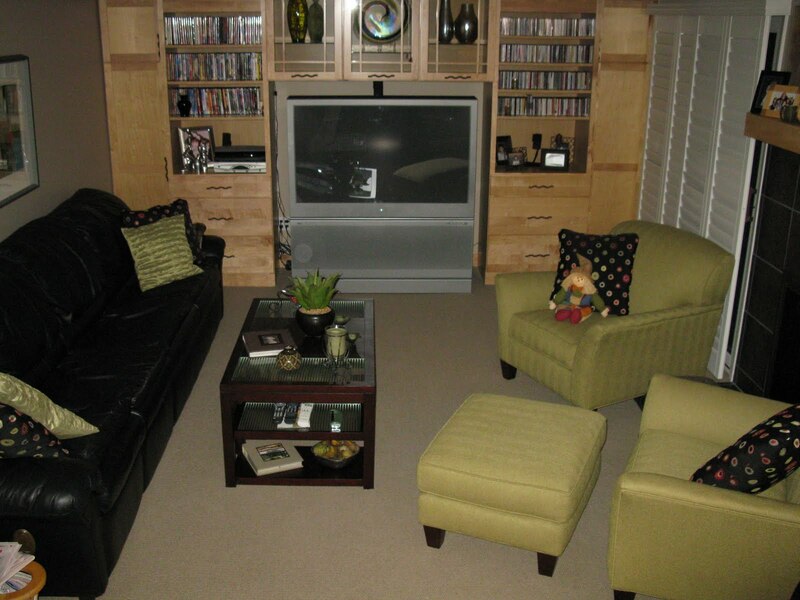 Now the truth is, he would rather be on his favorite black couch in the family room watching that big TV you see. But there is a small problem. It is broken. It has been since June, but my mom and dad used all their extra money redoing the house from all the water damage. You might remember reading about it. So instead we watch the little TV in their bedroom. That's ok. It makes us closer. Even Matt comes in to join us. Their new bed can hold all four of us. We are all saving to get a new TV one day. Saving is a good thing. 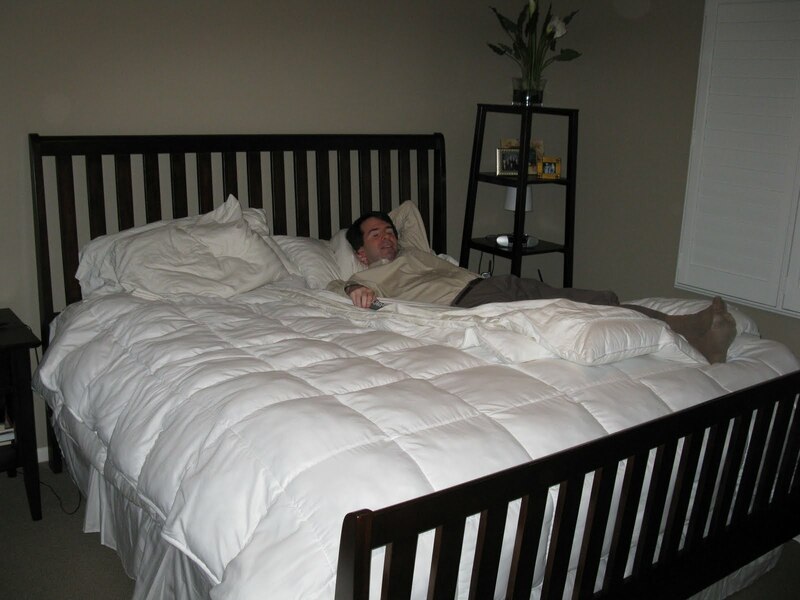 But I think I will miss watching TV with my Dad in his big bed. COUNT 1: In the County of Geauga, State of Ohio, on or about October 2, 2009 said child did knowingly cause or attempt to cause physical harm to another, to-wit: said juvenile punched Gus in the face several times, contrary to and in violation of R.C. 2903.13(A) Assault, a misdemeanor of the first degree, if committed by an adult. SUMMONS(order to appear)TO SAID JUVENILE and named parties(parents). You are hereby summoned and ordered to personally appear before this court on the 2nd of December. If your child is found to be delinquent or unruly, Ohio law authorizes the Court to place the child in the protective supervision of Geauga County Job and Family Services, or other out of home placement. As a parent, you have the right to be represented by legal counsel. However would we explain that to Miss Sarah? 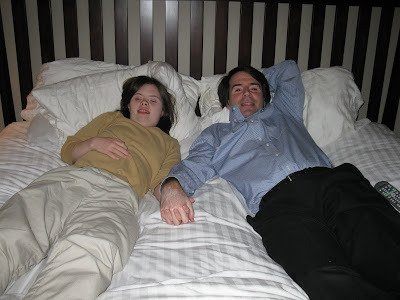 That the bond between them be broken due to a bully continually harassing and using the R word over and over and over even though he had been asked to stop multiple times. I love reading your blog. I think it's so amazing the love your family has. 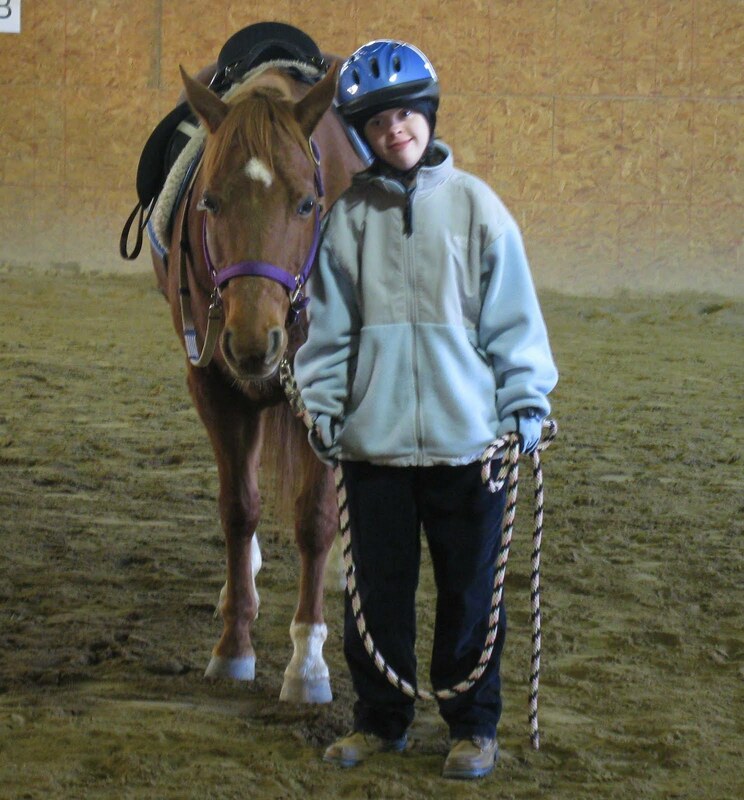 But I have to say I'm a little put off by some of the comments.To this boy, the R word is not bad. Just like to some in the south the N word isn't bad. He was not raised to know not to use that word. No, he shouldn't have said it. Yes, your son had a reason to be very upset. But if someone ever hit my son damn straight I would call the cops. No matter what was said punches were thrown.If your son was hit in the face by another kid you would be upset, anyone is lying if they say they wouldn't be. If everyone got hit in the face everytime someone said something someone else didn't like everyone would have a black eye.I hope it all works out for you and your family and I'm glad you found someone so close to the situation to help. Readers have asked why I did not delete this comment. And here's why: I believe that is the thought process of so many. "To this boy the R word is not bad." And that is why we need to use this case to make sure that others hear that YES IT IS. It is bad to use the R word. IT HURTS. Should Matt have punched. NO. He knows that. He has already written a post about it so others might learn from his mistakes. We hope that something is learned from this in the courtroom. Matt is ready to stand up and take his punishment. 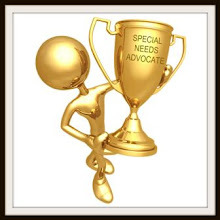 Whatever it might be, as long as the court hears that yes, the R word is BAD. A message from Joyce: Tiffany over at ElastaMom's Excerpts has been dedicating Tuesday to her favorite tunes and lyrics. I don't think Sarah would appreciate me taking over every week, but today she said I could tell you about this song that I have been singing for the past few weeks. Over and over and over. Never before have I so wished I had a crystal ball. Do you ever feel like that? Decisions would be so easy if I just had a little glimpse into the future...Sarah's future, my future, the future of our house, our neighborhood, Matt's High school years, the needs of my parents as they age, the direction of the healthcare debate, the future of our business, and the greatest question at the moment...a business venture I have been thinking about. This is TJ with Tommy Shaw. I grew up being a Styx's fan. So when the Contemporary Youth Orchestra that TJ played percussion with contracted with Styx for their annual Rock the Orchestra concert, I was thrilled. It was absolutely one fabulous experience. The concert, One With Everything, has been playing on PBS and VH1 Classic, so you may have watched it. 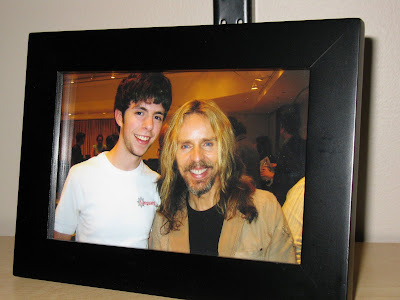 In my opinion, one of the best songs that Tommy Shaw wrote is Crystal Ball. How perfect the lyrics are. I so wish I had a crystal ball. In the meantime, I have been listening to this song over and over and over. 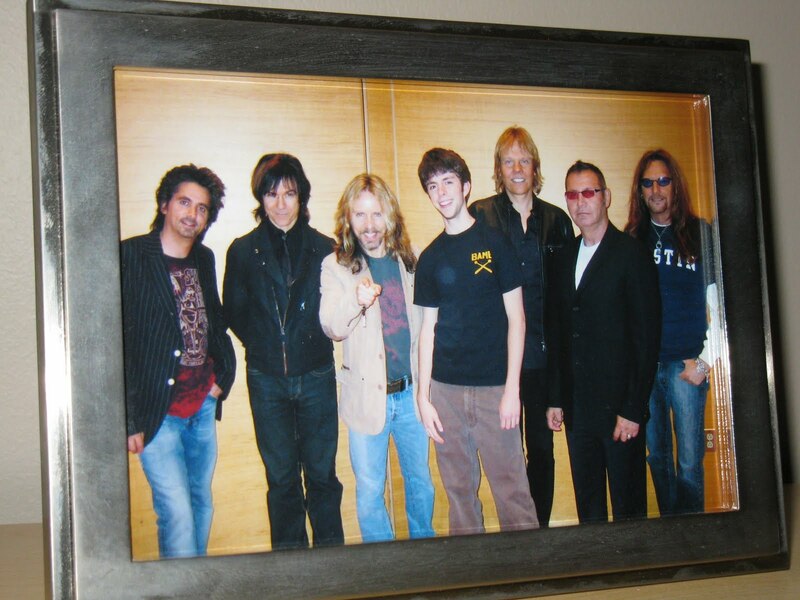 TJ with the entire Styx band in 2006. 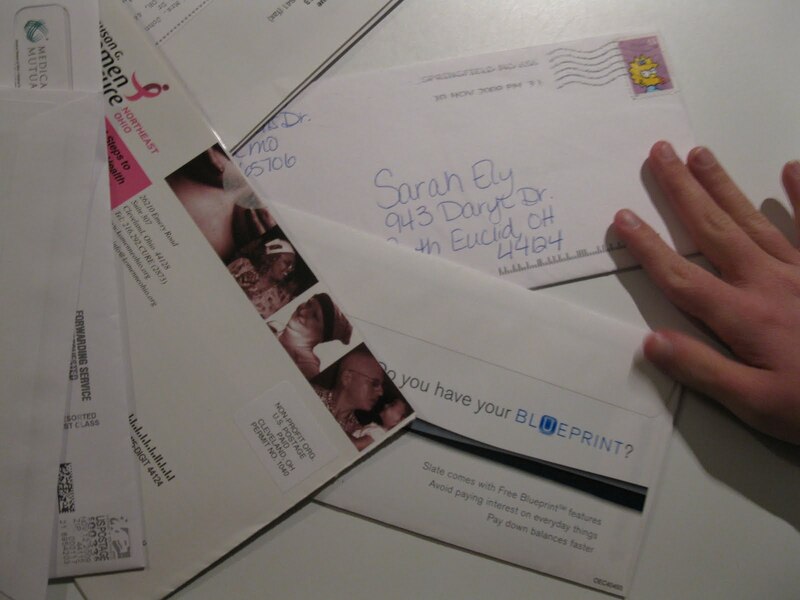 When I got home today I saw the mail on the counter. There was a letter for me. I wonder who it is from? 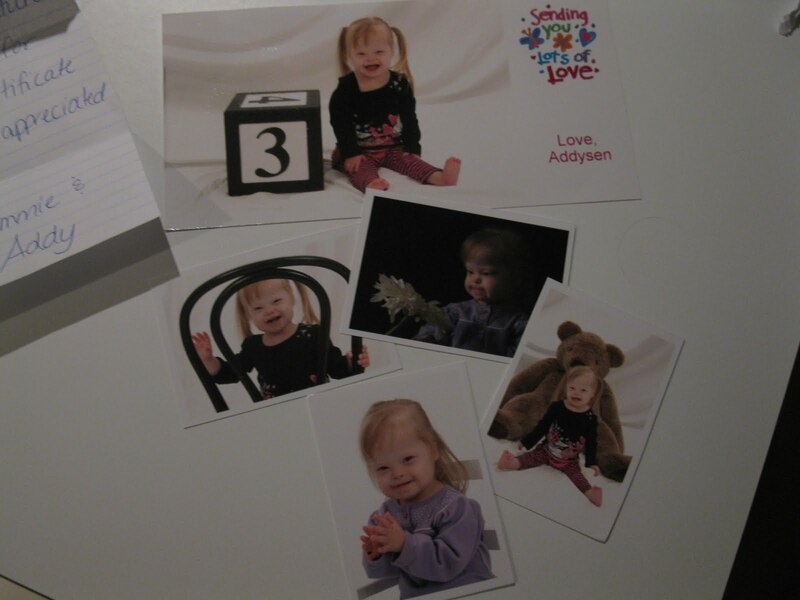 A nice note and pictures from Addysen. She was the lucky girl to win the gift certificate to Portrait Innovations. She is soooooooooo adorable. Thank you so much Addy. 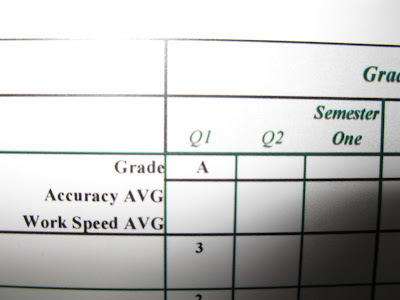 And if that wasn't enough, my report card came today from my job training program. 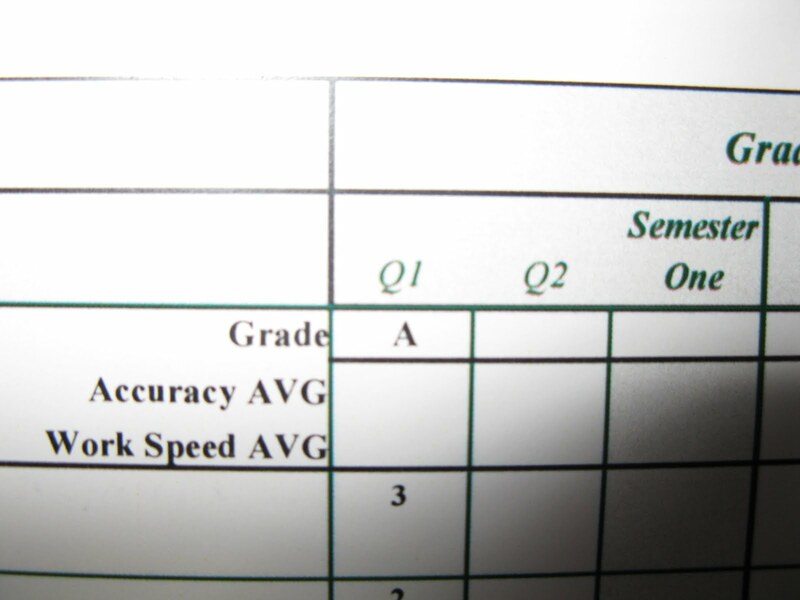 I got an A. I am so happy. 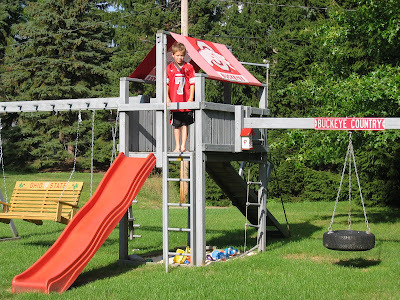 Unless this is the very first time you have visited my blog, you already know that we are a Buckeye crazed family. And yesterday, Ohio State beat Iowa in overtime to win the Big Ten conference which means the Buckeyes are headed to the Rose Bowl. 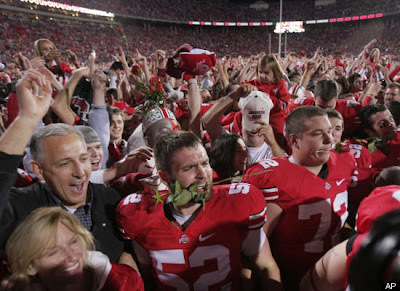 Look at all these crazy fans on the field after the game. Guess who was there with them? My brothers and my dad. Here is Matt all excited. TJ was somewhere down there too but he was on the student end. Now what do you think Matt is doing here? 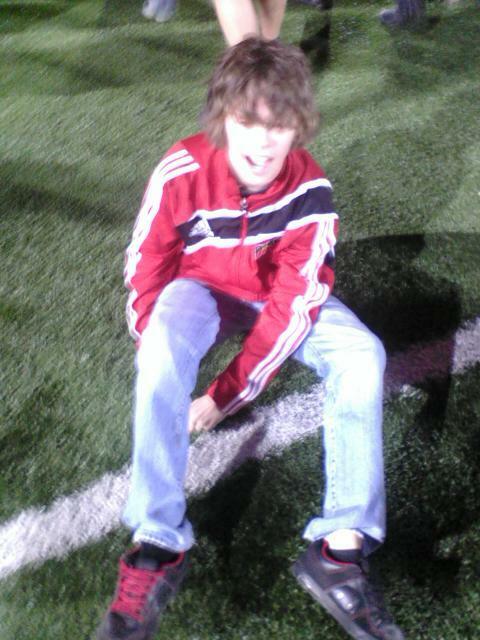 He is digging for these black things out of the turf to bring home as souvenirs. Boys!! Whatever:) If you want to see my brothers the last time OSU played in the Rose Bowl click HERE. All afternoon my dad has been playing these crazy videos on his phone. Over and over and over. I think he had a good time too. If you watch closely you will see Matt in both of them. It was such a beautiful sunny day in Cleveland. The temperature was 72. That is very warm for November. My Grandma & Grandpa decided to go for a ride and they came to see me at horseriding. Look at my Grandma standing there. She looked so good today. She was even walking around the camp. We were not sure she would ever walk again after her fall. And then her heart was acting up again so they put in a pacemaker. It is working very good now. She is full of energy. I think my Grandma has nine lives just like a cat. Look at me. 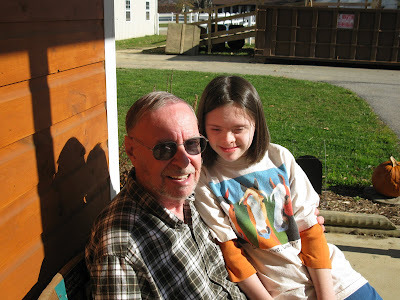 Even at twenty, I'm still a Grandpa's girl. For many years, I was known as the Queen of the Playground. 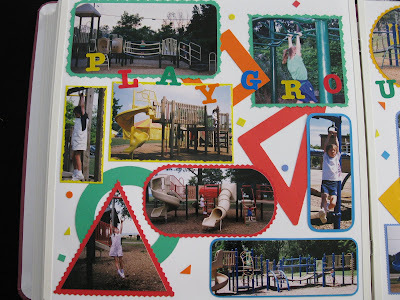 I have two pages in my scrapbook to show some of the playgrounds we went to. 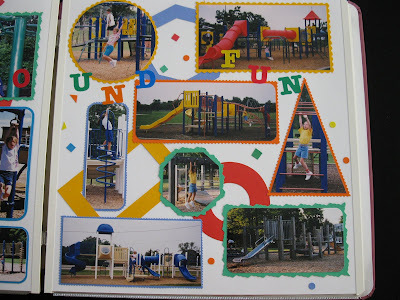 If you click on the pictures to enlarge them you will see that I am often hanging from the monkey bars or the rings. I was usually the only one in my class that could go all the way across. The rest of my friends would drop to the ground after two or three bars. Not me. My dad would tell me I was like the monkey at the zoo swinging from branch to branch. A message from mom: At first glance these just look like photos at playgrounds. And to Sarah that's what they are. To me they represent so much more. Like hours and hours of physical therapy. Yet something even greater. A few months ago I wrote about Sarah's birth story and described the day I was driving and came upon a school. It was the sight of the playground that brought me to tears, uncontrollable sobbing in fact. It was a visual for my fear. The frightening thoughts that Sarah would never learn to swing, or climb, possibly even walk or run. I think too, I worried that she would not be allowed to play on the equipment with the other children. 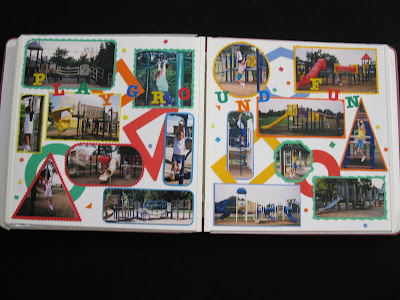 Years later, I look back with great fondness as we drove from playground to playground. Sarah could spot one a mile away. She just loved them. 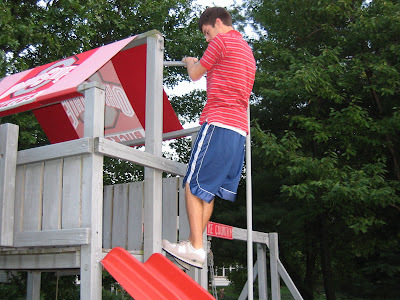 I vividly remember hearing parents whisper about the "little girl" while watching their kids fall off swings or not be able to successfully cross from one side of the monkey bars to the other. Sarah would patiently wait her turn. Then she would proceed to quickly swing from bar to bar and then back again. I would just smile. That's when the other children would frequently include her in their play. The upper body strength she developed was incredible. 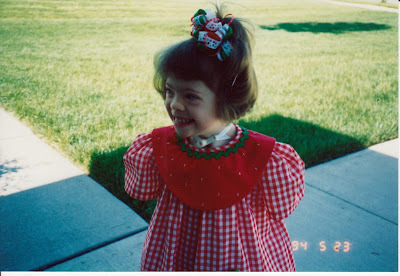 It didn't matter to her that she had a scar longer than my hand running down her chest or a deep indentation in her neck where her trach tube was once located. She did not listen to the naysayers that didn't believe she could do it. She just climbed her way to the top and performed her playground magic. Actually, I'm not sure that Sarah was aware that she didn't have to do it. Truthfully, that's one of the things I love about her. She just keeps trying. Sarah never gives up. I wish I had known that the day I shed all those tears. ...When I got home from work I saw a package on the porch. It is addressed to my mom. I recognize her name J-o-y-c-e. When I take it inside she asks me who it is from. So I read the return address. She says it is really for me. Hmm...now I really wonder what is inside. 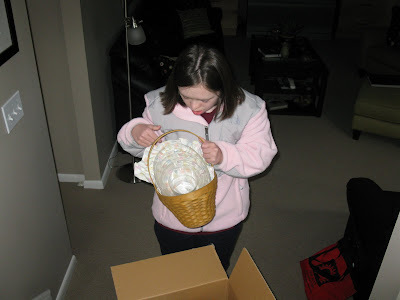 I WON TWO Longaberger Easter baskets!!! My mom says I am the luckiest girl ever when it comes to winning raffles. I do win a lot of raffles for some reason. Thanks to Christie for donating them for the raffle. Now here is some trivia. Do you know that the CEO of Longaberger is a Buckeye? Yep, Tami Longaberger graduated from The Ohio State University and her daughter is currently a student there. My mom, dad and brother met them at the Legacy Luncheon. Pretty neat. OK. 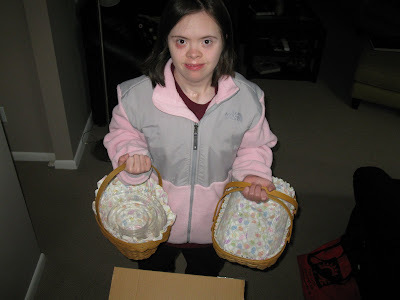 I am taking my baskets up to my room. I don't even care that the liners have little Easter eggs on them. I just really like them. a message from Joyce: For the past 26 years, I have been a member of Kaiser Permanente. All three of our children were born under the Kaiser plan and all of our doctors are there. The only time we have ventured out of a Kaiser facility was for Sarah's open heart surgery and subsequent care. So just the thought of changing insurance carriers has caused me a bit of fear. But we must. Soon we will be on a Medical Mutual plan. It does open some doors. Like going outside of a Kaiser facility. ...and how relieved I was when I saw that it is located at my beloved alma mater. 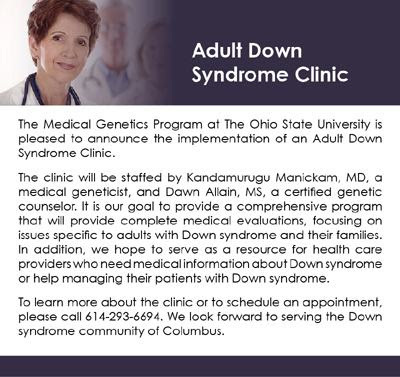 I think Sarah will be thrilled to go to Ohio State for medical care. We have to wait until January to make the first appointment though. That's when the new insurance takes effect. 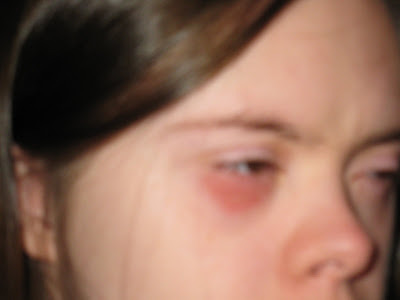 Look at my right eye. No, I did not get punched. This has been happening for about two months now. Most days it is fine. Then on some days, like today, it looks like this. It does not hurt. There is nothing wrong with my eyeball. No discharge or crusty stuff like pink eye. Any idea what it could be? My mom just told me I am going to have to go to the doctor. I do not want to go to the doctor. "I am fine," I told her. But she thinks it needs to be checked out. I am not happy about this. My playset. The final days. The wood was starting to rot, so my Dad said we needed to paint it. We decided it would be fun to make it scarlet and gray. The little swings were all rusty so we replaced them with a double seat swing. The tire was old and it was cracking, so my mom was afraid for us to use it. Northeast Ohio winters are hard on playsets she said. TJ's feet grew so big he could hardly climb up the little steps. But he made it one last time. We took one more picture in 2005. For the fourth of July. We decided to bring our Build-a-Bears out with us too. That's my Great Grandfather's flag behind us. We used tools from his hardware store to build it in 1990, so it was only fitting our last picture included his flag. And that was about the last time we used the playset. 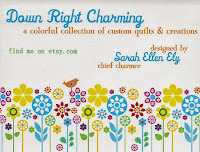 Please go over to my friend Kristen's blog. I am so sad that she will be in the hospital for so long. Again. Kristen is a fighter, but she needs our prayers. We are thinking of you Kristen. On Tuesday as I was leaving the place we vote with my mom, my dad walked in. 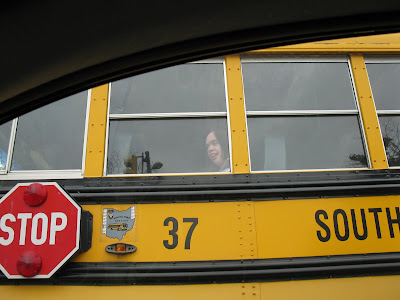 Then today I was on my way to the nursing home I am working at and the bus was stopped at a red light. When I looked down into the car next to us...it was my mom...on her way to the post office. They are everywhere and that makes me smile. Haaa...I am a Cleveland Indians fan...the truth...TJ brought the shirts home for us the summer he studied at Julliard:) It's always nice to applaud the winners though. 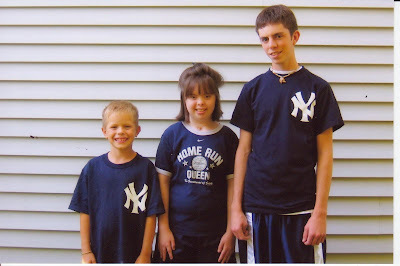 Congratulations NY Yankees!! a message from Joyce: I promised I would tell you today a little about what has been distracting my time from blogging lately. The short story is, we have a new employee. Her name is Sari. She started on Monday. 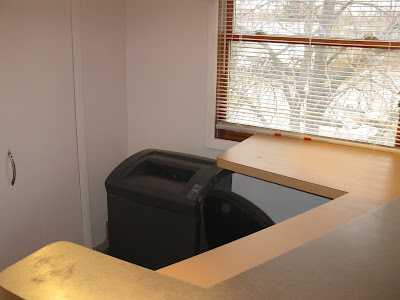 We (John, Matt and me) have been frantically cleaning a section of the office to make it just right for her arrival. Her area is over in the corner behind the counter. So, what's the big deal, you ask? Truthfully, this is huge. 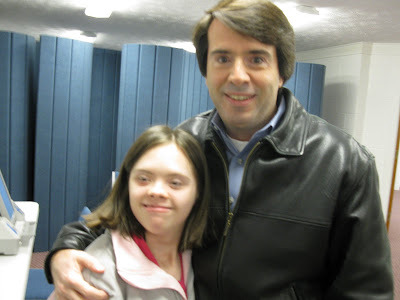 Last spring I wrote about the day Sarah and I visited the Adult Activities Center where the County Board of Developmental Disabilities would likely place her when she ages out of the job training program she is currently in. As in most states, that will happen when she is 22. However, there is a waiting list for services, so there is no guarantee of that happening for several years. 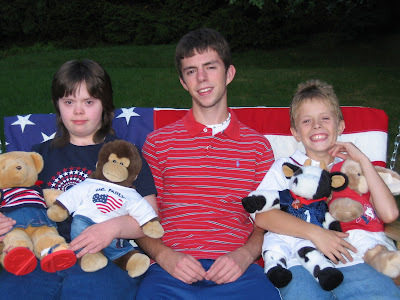 The greater issue for me was the general idea of sending Sarah to a large facility with 200 plus other adults with disabilities to "hang out" all day. Not my vision of where she would be after all these years of hard work. I soon found out though there are not a whole lot of alternatives due to funding shortages they claim. A separate concern for me was the transition process. If you live on the eastern side of Cuyahoga county and have a high school student with a disability, they are often in a program referred to as CEVEC. It is an excellent operation. The entire concept is they train the teens in the community in real job sites. But then on their 22nd birthday, or there about as some districts will let them finish the year, they transfer over to the County Board of DD and a whole new set of adults and placements take over. Huge disruption to a young adult in my opinion. Especially for those who transition is already a difficult issue. So last spring, I started dialogue with staff members from both entities. Some were cooperative, some were not. My concept was this: Find a company placement in the final six months of CEVEC that would then hire them as an employee once they reached their 22nd birthday and aged out. Behind the scenes the adults can handle the paper work involved in transitioning from one bureaucratic entity to the other. For the young adult involved, it would be a seamless transition. In fact, they would not even realize a transition is occurring. Going into this I knew I had an advantage in these discussions, as my husband and I own a business. Not only do I see the challenges from a parental view point, I can pilot the thought process with jobs. So after many meetings, drum roll please, our first new employee from CEVEC arrived this week. 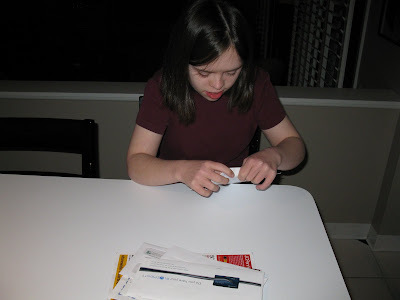 She is a delightful young woman with Autism. During the interview process we learned she has some distraction issues and does not like to work in a large environment. 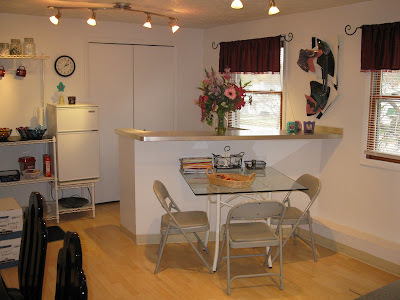 Hence, the corner area. It has a feel of privacy so she will hopefully be more comfortable. Yet it is in the snack/lunch area so she will have to interact and socialize with the employees for short periods. This is important to her family. She comes to us initially with a job coach who will stay with her until she learns her duties. She will start out with shredding. We are a medical billing company so we have an endless mountain of paperwork that must be destroyed appropriately. The concept is when Sari turns 22 in January, she will become a member of our staff and I will be her immediate supervisor. Behind the scenes, the County Board of DD could be called in for consult if needed. It's a start. A small beginning that I hope will make a difference. For Sari, and one day for our Sarah. I'm pleased with the initial phase. Sari is so excited and her family is thrilled.